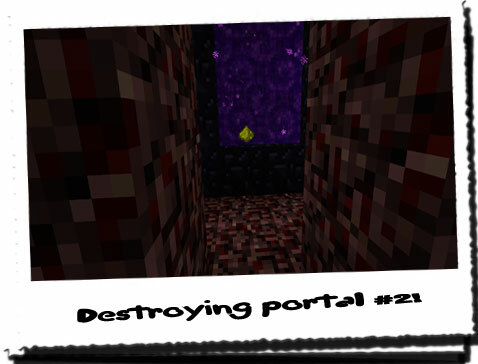 Diary of a Miner: Day 74: The last of the portals are destroyed! I woke up quite early today; my tent was facing East, and so I essentially woke up with the sun! 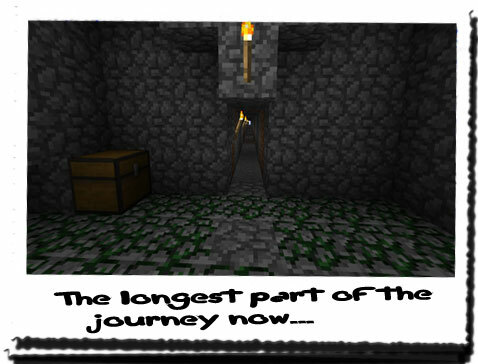 I knew that today was going to be the last leg of the journey, and then I could begin my way back. I had decided last night that I was going to take the boat back, if it was still there, as it would be easier and quicker, even if I did only take it as far as the little join between the islands. I packed away the tent and sleeping bag, and had a quick breakfast before setting off. I wanted to make rapid progress this morning, and hopefully be back at the dirt hovel via the tunnel before midday. That way, I could make the journey to the temple, destroy the two portals, and then go back through the tunnel to the beach where I left my boat. If the boat wasn’t there, I would simply have to walk back. If that was the case, then I would probably make it back home late tomorrow evening. I waded the short distance across to the small island in the middle, and then continued the rest of the trip to the other side of the island. From here, it was simply a case of finding the location of the previous portal, go down to the tunnel and follow it West until its end. As it was still hot, I dried off very quickly, which made life easier. The leather bag was waterproof as well, so it was a good job I had stashed the map away. I took it out though at this point, trying to recall the location of the flat, cobblestone pit. I was approaching it from a different direction this time, so there were no useful landmarks or noticeable features to use as guides. Also, because of the large tree density in the area, it was difficult determining how far inland I was on the map. I continued West, in the general direction of the red circle. I was being more cautious now about my surroundings due to the large amount of Creepers I had seen on this island before! 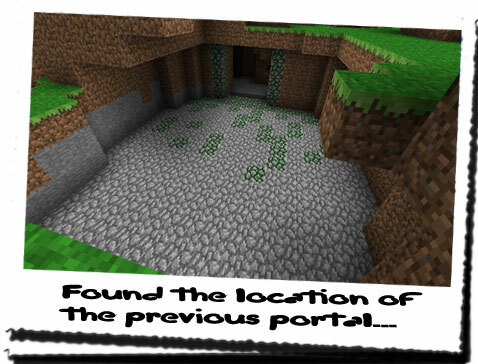 Admittedly, I had managed to drive them into the portal – where they may have originated from in the first place – but I didn’t want to come across anymore! I was well equipped to take one down if it came to it, but I was hoping that the cost was all clear. I was also weary for guards as this would be one of the key locations that they would think I would use to get back to the portals. Well, if they had thought of that, they were right! 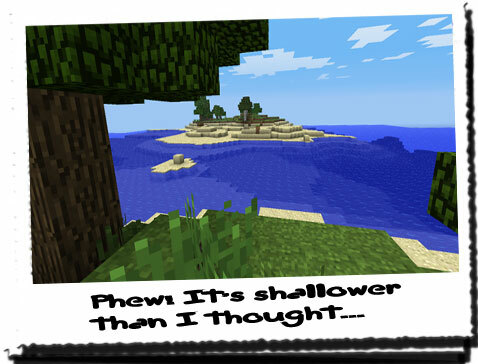 However, I didn’t see anyone or anything, and within an hour of leaving the water behind, I had come across the pit! It was much easier to spot when I approached from the East as there was no cover for it. Usually it would hide under a small lip, but this time it was fully exposed! The next three to four hours was very boring… Once again, travelling down the same tunnel I had passed down within the last few weeks… It had seemed like an eternity had passed since then! I had found more portals, been captured and held against my will, escaped and then hunted down, forced to retreat to the East to the house of a dead miner who had belonged to a group who were plotting to take down the very company I worked for! A LOT had happened since then… Despite the bow and arrow still in hand, I had relaxed slightly, and my mind had gone back to wandering again. I was still fascinated by this “L7” group that THEROS had become part of. Hopefully, soon I would be granted access into their inner workings, and help to take down a company who had committed so many acts of violence and evil! At times like these, I’m glad I never got married or had kids! They would more than likely have been taken for ransom and tortured, with the threat of death unless I turned myself in… I also started to think about where L7 might be based… For all I knew, they could be based right under my house and I would never know about it! I doubted it, but it was bound to be somewhere nearby if they were able to send rapid communications and keep an eye on me! I entered the temple, and straight ahead I could see the shimmering purple of the portal. 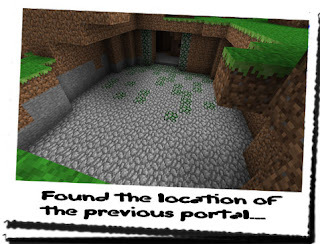 It had been awhile since I had seen one, and the sight of the iridescent purple rift made me shudder slightly… I began to advance towards it, careful not to make too much noise in case a guard or a Creeper was hiding somewhere. I entered the small chamber that the portal was contained in and got straight to work; taking the stone from the bag, I placed it onto the bottom of the frame and stood well back, in the archway. The same process happened again after a few seconds; the rift began to change colour from a deep purple, to a sickly green, and the stone slowly faded from sight. The obsidian frame of the portal then began to warp and distort inwards towards the centre of the rift. This was it. I watched through the entire process, as the frame slowly began to crumble, and was pulled into the centre. The rift began to slow down, losing energy as more and more of the frame disappeared into the void! After a few moments, the last few fluttery purple particles disintegrated and disappeared. I waited a few moments more until the stone began to glow ever so slightly. It would take another hour or so before this stone was recharged and ready to destroy the last portal. Time to scout out the area! I went back upstairs, noticing the putrid smell retreat slightly. Was there a link to the smell and the portals? 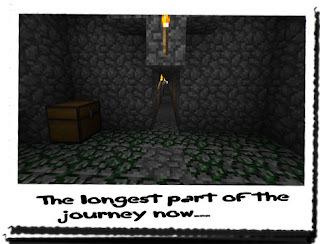 It didn’t matter… Soon the last portal would be gone, and I could make the return journey. As I got to the top of the ladder, I felt a sickening feeling of déjà vu… I slowly entered into the room, and stared at the doorway. But there were no shadows, no faces or anything to suggest a presence. There were no noises either… Walking out of the door, I turned around and looked up at the staircase to see if there was anybody there… Nothing… I went back inside. I put the bag on the ground, and placed the stone on top of the table to watch it as it began to recharge. I began drinking some milk, looking around the room at the same time. Despite being here for the second time, I still didn’t know who this house belonged to! Was it one of all of the L7? I doubt it! 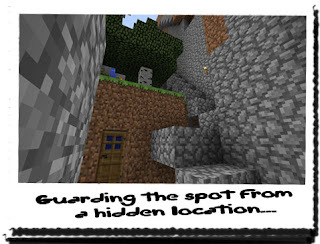 It must be a miner who moved on after… Wait though… When I had first found this place, there was a bowl of hot soup still steaming on the stove! None of this added up! Whoever lived here must still live here! Surely…? Maybe they had ties to HoN Co. or the figure… I cast it from my mind, trying to keep it alert. I finished the milk and began on a chunk of bread. After finishing it, I took the stone in my hand and went back outside to hide. If I disappeared, maybe someone would come back. I couldn’t be entirely sure that no-one was watching over the house. I sat and hid in a location which overlooked the house and the stairway leading down to it. If anyone came up from the tunnel, they would pass me to get to the door, so I would see them! I stayed there for some time, waiting for someone – anyone – to walk past, but no-one did. It was odd; here was a very valuable target to HoN Co. and the figure! I had gone missing, with the stone, and it hadn’t occurred to them to post some guards to prevent me from destroying them…? It was either a very stupid point they had overlooked, or they were setting a trap… Knowing HoN Co. a little better, I guessed the latter, but I didn’t want to be the one to spring it! Eventually, the stone regained its original colour, and it began to glow with an intense yellowy hue! I went back inside, closing the door behind me. Going back down the ladder, I went back to the temple and to the remaining portal in a small chamber to the right. Repeating the exact procedure as last time, I stood back and watched the show! It was oddly beautiful how it worked, and it also served a purpose. After a few moments, the last portal had completely disappeared from existence, and the stone began to reappear. I picked it up, and returned to the house. Now all I had to do was return home. Well, I say “home”… The house of Jonas. I would be leaving there soon anyway. I wasn’t sure how the L7 or THEROS knew whether I had destroyed the portals or not, but I assumed they would find out somehow. I’m having a quick rest before I head back. The journey has been tiring, and I just need a few minutes to have something to eat, something to build up my energy before heading off. I’m not going to go to sleep as I’m in a precarious position as it is simply being here! I’ve finished the task the THEROS demanded of me, and hopefully I will be leading a whole new life as someone else within the next few days… I wonder if I’ll get a nickname…? Surely THEROS isn’t their real name?